They are not obvious like other alternate energy technologies-no spinning wind turbine blades or cool solar panels on the roof of a home-but they get the job done and save energy and costs for the consumer. We are talking about geothermal heating systems. 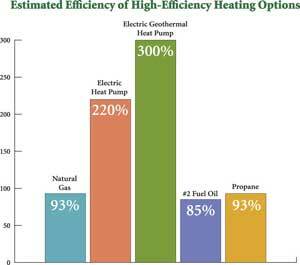 Heat from the earth is collected and used to heat the home-see photo below. 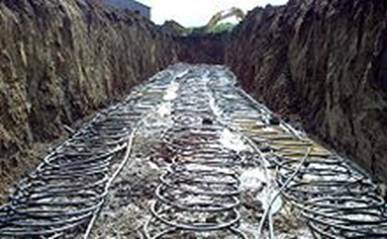 Coils filled with water or antifreeze are circulated via drilled wells or direct burial around the home [about 6-8 feet underground in a trench system] to collect low grade heat in the earth. This low grade heat is “bumped-up” with an electrically powered, efficient, heat pump to make it compatible with the temperatures required to heat the home. Check it out at You Tube. Geothermal coils trenched into the earth. 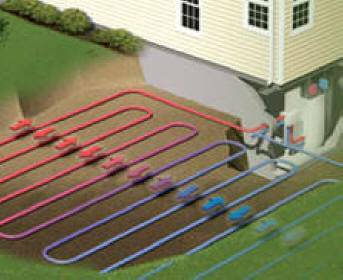 The size and layout of a geothermal heating and cooling system all depends upon the design of the home, geographical location, sub-surface soil conditions, and whether the home already exists or is to be built new. Its operation is simple to understand, not much different than how a refrigerator or air conditioner works [see Editor’s Deep Dive below]. For a traditional size home, the amount of equipment will easily fit inside the home’s basement area, not all that different from conventional home heating systems. Geothermal heat pumps are making big headway in new school construction and commercial buildings too. The cost of a geothermal heating system in a new home is roughly about twice that of conventional heating systems, a premium on the cost of a new home—an amount that could be easily included into the mortgage of the home. Retrofit situation costs may be higher, as house and site conditions may vary significantly. In a simple installation scenario, geothermal systems might achieve an economic payback in 3-5 years. The EPA estimates homeowners can save 30 to 70 percent on heating and 20 to 50 percent on cooling with a geothermal system. 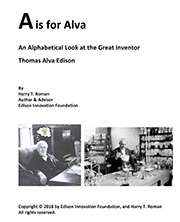 Thomas Edison and his lovely wife Mina shared a love for nature—she for the biological world, conservation, bird-watching, and horticulture; and he for the use of natural products in his inventions, and a fondness for natural earth energy sources. This life-long natural credo, along with the need to control the temperature and humidity swings in their historic and spacious mansion at Glenmont, motivated the 2005 renovation of their beautiful twenty-nine and-a-half room Queen Anne Victorian style home [see photo] to include a geothermal heating and cooling system. 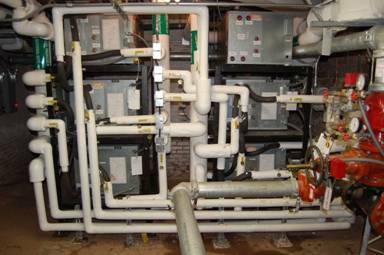 In the summer, heat is extracted from the house using five heat pumps with a sixth functioning as a spare. The extracted heat is deposited deep into the mountain soil surrounding the home via a closed-loop water distribution system. Each well is approximately 5 inches in diameter, and 350 feet deep. The well field is about 150 feet away from the house. In the winter, this stored heat is brought back into the house to help warm the structure. 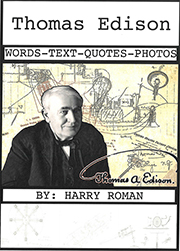 The earth acts like an energy bank from which deposits and withdrawals may be made. Keep an eye out for this technology to make big inroads into the nation’s energy mix. 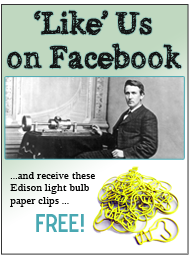 Like Edison, it’s a sure-fire winner, and a way to keep our environment green! According to the U.S. Dept. of Energy, about 50,000 geothermal heating systems are installed each year……with an estimated total of about one-million systems in operation. 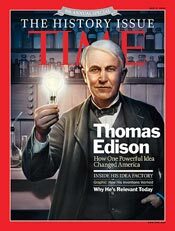 This entry was posted in All About Tom and tagged Geothermal Heating on April 16, 2013 by Edison Innovation Foundation. Excellent website. Loads of beneficial info listed here. I’m just submitting that to some buddies ans on top of that expressing inside delectable. As well as, thank you on your own efforts!